Breakfast at Tiffany's was on TCM last week, and so I watched it for the bazillionth time, as usual. However, during this particular viewing I realized something that I hadn't before. I couldn't care less if Audrey and George Peppard end up together at the end. To me, the film reaches its emotional climax not because George and Audrey embrace, but because they have Cat between them. Holly does seem to have greater chemistry with the cat and supporting players than with Peppard. Peppard's character is too full of himself to make me cheer for their marrying or having any contact at all. I do like the cat better ... and the bathtub couch. I felt the same way around the second time I saw Breakfast Tiffany's. needless to say, this is probably one of my favorite talkies: not because of the actors and actresses, not because of the storyline, because of the CAT. why aren't there more talkies with super awesome cats like this one? Seriously. Not just crazy cat ladies either! I feel exactly the same way. I admit to worrying about the cat getting wet. His expression seems to scream "Put me back in the box! Put me back in the box! I'm getting WET! Kiss later!" Oh my gosh. I've never seen this movie, but I'm so glad I read this. I would have FREAKED out about the cat if not forewarned. LOL. I have to admit that I worry about Cat's fate as well. Every time I watch the movie I worry about Cat and always hold one of my kitties if one is near. Of course, my sister--a crazy cat lady to my crazy cat gentleman--had a more intense reaction. 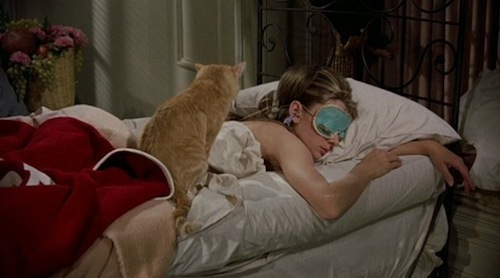 After Holly put Cat out on the street, she refused to watch Breakfast at Tiffany's ever again! I love that movie and this is such an interesting post! This post is brilliance! AHAHAHAHAHHAA! And I always feel so sorry for that cat (and I don't even really like cats that much)! Great post! And I'm with you, it is all about the cat. From the beginning of the movie that is all I can think of, that poor cat! Great site and post, Kate. Although Missy's at the top of my list, I'm an Audrey follower too! I actually named my first cat, CAT! It's all about the CAT. True and very therapeutic! Oh, and you're art works are wonderful! So true!! I caught the end of the film a couple of weeks ago having not seen it for years, and actually though I would've loved to have seen it all - this is the bit that matters, and yes I felt a huge lump in my chest and almost held my breath until she goes back to get. Mad cat ladies, oh yes indeedy! Had to come here to comment because couldn't at SB.. But that is the way i have always watched the movie, it's all about the cat. I showed the movie to my newish boyfriend and for him it was all about the cat too. Im never letting him go. And we are getting a cat.